1/ In a large freezer bag, mix all the marinade ingredients (orange juice, lime juice, powdered garlic, shallots, brown sugar, cumin, olive oil, salt and pepper). 2/ Add the pork shoulder directly to the bag and let marinade overnight in the refrigerator. 3/ After removing the meat the next day, insert the meat°it probe into the thickest part of the shoulder and program the application for “Pork”. 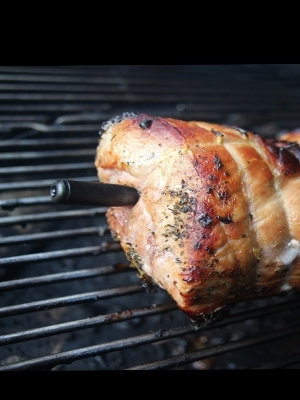 4/ Either in the oven or on indirect heat on the barbecue, cook the pork until the core temperature reaches 145°F/63°C. 5/ Take the meat out of the oven once the probe sounds the end of cooking time.